Amla or Indian Gooseberry is a popular Indian fruit that is sour and tangy and rich in Vitamin C. Apart from being used in a variety of food preparations, it is also used in hair care products since it provides a fix for hair fall, dandruff and dull hair problems. You can either make amla hair oil at home or pick up one from your nearest supermarket. 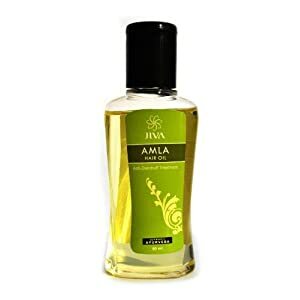 There are a number of amla hair oils offered by many popular brands which promise hair growth, a problem free scalp and lustrous hair. Let’s take a look at some of the best amla hair oils in the market that can give you lustrous and healthy hair. Dabur Amla hair oil is one of the most popular amla hair oils in India. It is a deep conditioning hair oil that prevents the dryness of the scalp too. Dabur Amla Hair oil prevents premature greying, promotes circulation and hair growth. It reduces any itching and flakiness in the scalp. It has a strong fragrance and best used overnight. It is priced at Rs. 84 for 200 ml. The Nihar Shanti Amla Hair oil prevents premature greying, dandruff, increases the strength of hair follicles and reduces hair fall. It has a coconut oil base that is blended with amla and almond oil. It is priced at Rs. 70 for 300 ml. 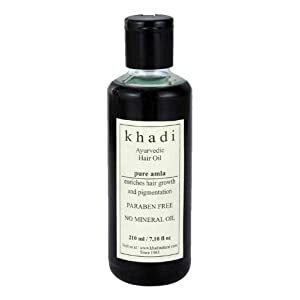 The Khadi Pure Amla Herbal Hair Oil gives the hair a soft texture and natural shine. It enriches hair growth and pigmentation. Regular use will prevent the occurrence of dandruff or split ends and will replenish the moisture all through the hair shaft. It is priced at Rs. 350 for 210 ml. Another popular amla hair oil, the Bajaj Brahmi Amla Hair Oil has amla blended with brahmi leaves. Brahmi is a mind tonic that helps improve memory. Amla guards you against hair loss and gives you strong hair. The oil is a natural conditioner which also prevents dandruff and premature greying. It is priced at Rs. 75 for 200 ml. The Purenaturals Herb Rich Amla Hair Oil is an organic hair oil with amla, bhringraj and hibiscus. The rich herbs are blended in cold pressed jojoba, coconut, sesame and almond oils that are rich in vitamin C and E. The unique blend ensures that you have thick and long hair that is strong too. It is priced at Rs. 395 for 100 ml. The Jovees Amla and Beal Revitalizing Hair Tonic contains Beal, Amla, jatamansi and other herbal extracts that are great for the hair. The tonic is a non-greasy formulation that nourishes the scalp and adds volume to the hair. The tonic is light and does not have to be followed up with shampoo. You can use it as a leave on conditioner. It is priced at Rs. 115 for 100 ml. The Jiva Amla Oil is a non-sticky formulation that prevents hair fall and premature greying. The oil is a mix of amla, almond, jasmine and jape extracts. It seeps into the hair follicles and nourishes it and promotes hair growth. It is priced at Rs. 85 for 60 ml.